Crossover hatchbacks are an interesting invention, as they merge the compactness of hatchbacks to SUV-like body styles. 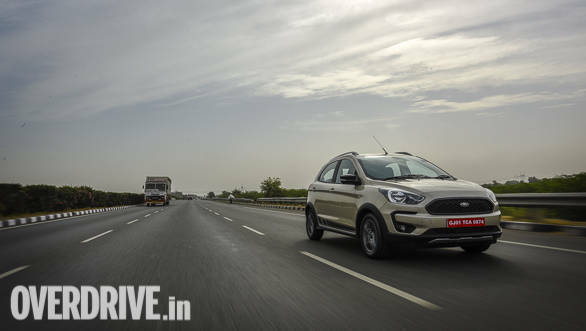 Given Indian buyers' penchant for all things SUV we've seen a number of such cars get launched in the recent past, and the newest one to join the bandwagon is the Ford Freestyle. 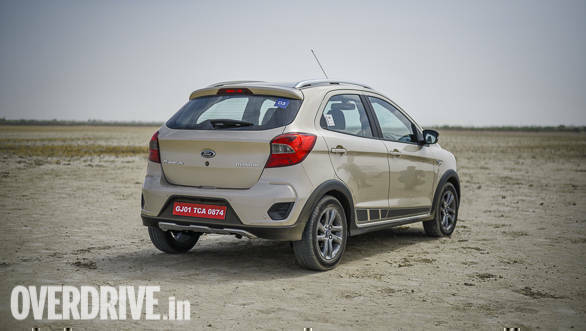 The car also marks the debut of Ford's brand new 1.2-litre three cylinder petrol engine and new 5-speed manual transmission. What is it like to drive? Read on to find out. Is it just a hopped-up Figo? Not really. The design might suggest so but Ford tells us the Freestyle is almost entirely new. The front end looks similar to the Figo's but look closely and you'll notice the difference in the detailing of the headlights. The new grille looks more distinctive, though the biggest visual differentiators up front are the C-shaped surrounds for the fog lamps. There's faux skid plates at both ends as well as black plastic cladding all round, including the wheel arches, to add to the SUV-like feel. The Freestyle also gets a set of roof rails and we're told these aren't merely ornamental, and can hold up to 50kg of weight. There's subtle differences at the rear too, like the revised tail lamp design and restyled bumper. The Freestyle also gets new, 15-inch alloys shod with 185/60 section tyres. Ford tells us 16-inch wheels were considered but those would have compromised ride quality. There's more serious changes under the skin as the chassis has been modified to widen the track, though the wheelbase is the same. Ride height is obviously higher and unladen ground clearance stands at 190mm, which is 16mm higher than the Figo. 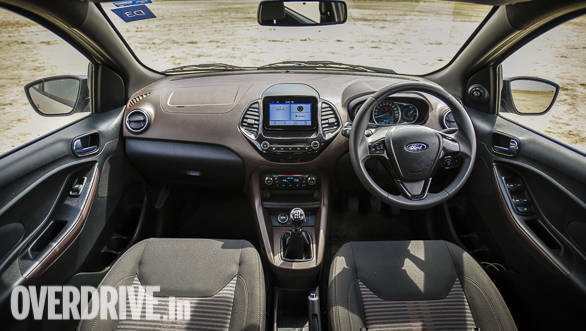 The Freestyle's interiors look identical to the updated EcoSport's. Effectively the Titanium variant gets the same 6.5-inch touchscreen, equipped with Ford's SYNC 3.0, which offers Apple CarPlay and Android Auto connectivity. The interface is slick and touch sensitivity is good though menu options can be slightly confusing. A slight disappointment was the design of the instrument cluster and air-conditioning controls. The design hasn't changed much since the Fiesta's days and looks dated. A white background and different font for the numbers on the meters would have surely brought some novelty. The dual tone, black-brown dashboard looks nice while plastics are nice to the touch. The Freestyle also feels spacious  I had no trouble making myself comfortable at the back even with two six footers in the front, despite being nearly six feet tall myself. 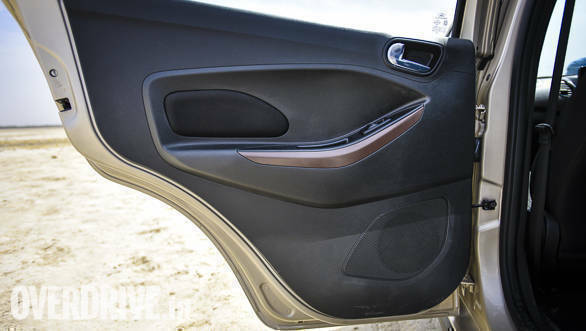 Surprisingly the Freestyle's rear doors do not have pockets at all which means there's no space to store water bottles or knick-knacks. On the safety front the Freestyle gets dual front airbags as standard while higher variants like the Titanium get six airbags. 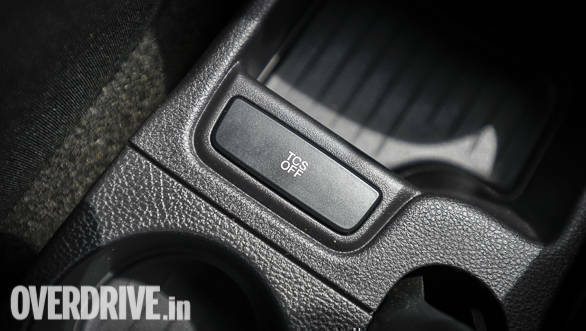 Traction control, ABS and EBD are on offer as well, while a unique addition on the safety front is ARP or Active Rollover Prevention. The ARP detects an impending roll using sensors if the car starts skidding in one direction, and applies the brakes along with engine braking to slow the car down. What about the engine and transmission? 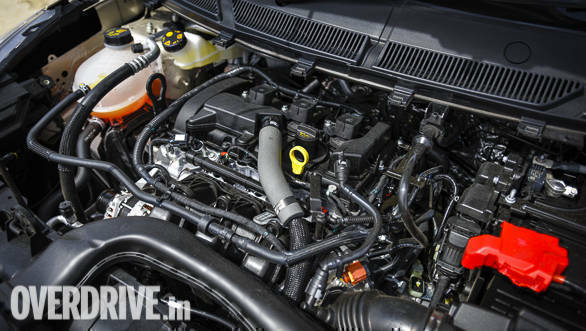 The Freestyle gets Ford's new 1.2-litre three cylinder engine that is part of its Dragon series of engines. 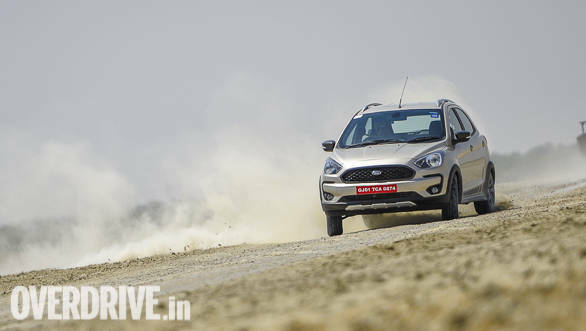 The engine offers 96PS and 120Nm, and Ford claims the power output is the highest for a 1.2-litre petrol engine in India. The motor is slightly laid back when it comes to building revs but rev it hard and it delivers a good punch. The Freestyle also debuts Ford's new 5-speed manual transmission. Its ratios help in enhancing bottom end grunt and the engine and gearbox are tuned more for city driving. This was apparent even more on Rajasthan's open highways it was easy to note that the midrange was punchier than the top end grunt. The engine feels smooth throughout, and I was glad to note Ford has nearly eliminated the typical vibration three cylinder engines are known for. I found gear shifts were slightly notchy, but Ford was quick to inform the gearbox on the test cars were brand new and that they should feel better once run in. Interestingly, the new gearbox uses up to 40 percent lesser oil than the older one claims Ford, which should result in higher savings in the long run. Its all-new powertrain is a definite highlight but the bigger star of the Freestyle's show is its excellent ride and handling package. The car uses the same struts as the Figo but spring rates are different and Ford has nailed the setup. The Freestyle has no trouble gobbling down broken roads without unsettling its occupants or losing composure itself. It remained unfazed on some of the worst terrain, including the hard packed, potholed soil on the salt flats of Sambhar Lake near Jaipur. 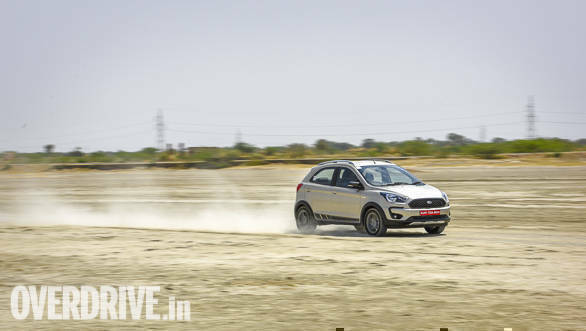 The suspension also makes for a very confident feel when driving enthusiastically, irrespective of whether you're on smooth asphalt or non-existent roads. The wider track benefits handling as well by adding to the planted feel. 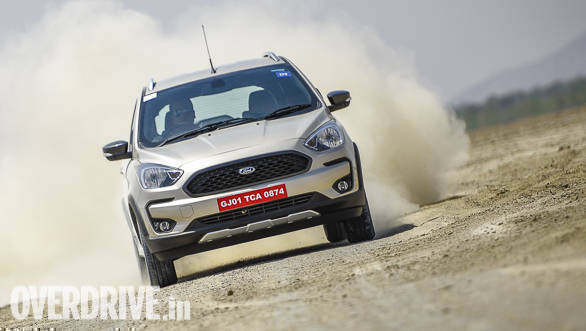 And in typical Ford tradition the Freestyle's steering is very communicative which adds to the driving experience. The seats are comfortable too  the padding is on the softer side but not too soft, which helped me sink in to the right degree. A few hours behind the wheel are barely an indication but my experience tells me the Freestyle is a driver's car with its kind of dynamics and one that balances passenger comfort rather well too. 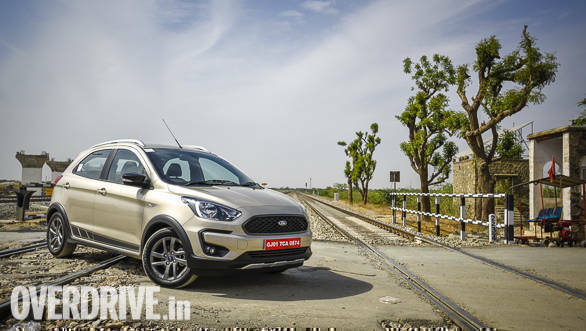 Ford claims its spare parts cost up to 20 percent lesser than those of similarly priced hatchbacks, and also that the Freestyle's service interval is the highest in class at 10,000km. 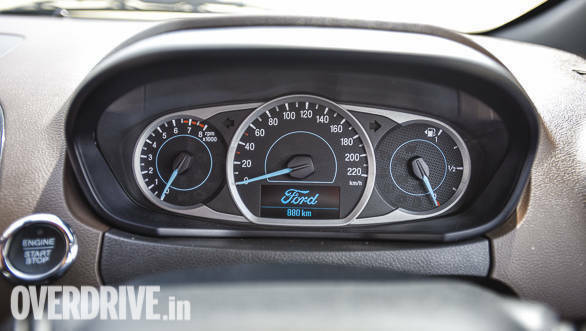 In fact, Ford tells us that per kilometre running costs for the petrol and diesel versions of the Freestyle are 41 paise and 51 paise respectively over 1,00,000km. The Freestyle impresses with its dynamics as much as it does with its comfortable feel, whether behind the wheel or not. The styling is impressive though the light gold shade of our test car didn't do justice to its design or its sporty character. A bright red, yellow or turquoise blue shade would add a lot more pizzazz to the car's appearance. The claimed service costs are impressive and Ford is really going to town highlighting the low costs of ownership for its cars, which is something worth taking note of in a market like ours. The Freestyle feels solidly put together and had no trouble taking all the battering it was subjected to over the course of our drive. 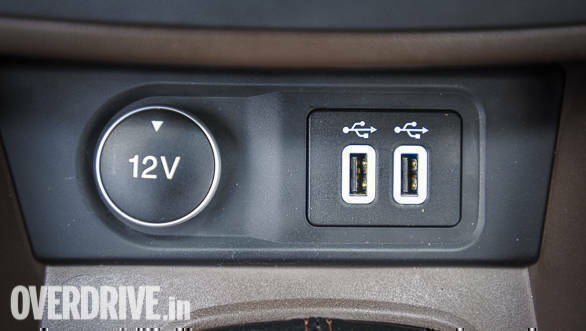 When launched in a couple of weeks from now it should be priced between Rs 6 lakh to 8.5 lakh and command a premium of about Rs 50,000 over the Figo. That should make it an interesting proposition as an SUV-esque, sporty, comfortable hatchback that also boasts impressive equipment levels.